William Clifton “Bill” Boyce, Jr., who distinguished himself as a highly successful piano retailer throughout his remarkable 60-year career in the music products industry, passed away peacefully in his sleep on Saturday, February 2 in Bradenton, Florida. He was 78. Bill was best defined as a tireless entrepreneur, savvy businessman, guiding mentor, devoted husband and wonderfully loving father. 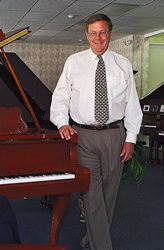 He, along with his wife Sandy, was the owner of and guiding force behind Palmetto, Florida-based Piano Distributors, one of the most successful piano store chains in the nation, with thousands of satisfied customers largely in the Southeast. Born July 9, 1940, in Raleigh, North Carolina to William and Virginia Boyce, Bill grew up in Windsor, North Carolina. His six-decade career in the music business effectively began in 1959 when, at the age of 19, he was invited by his uncle, Edwin Poole, a band director in North Carolina, to join his Raleigh piano store, E.R. Poole Music Co.
Bill’s initial calling was in the field of engineering, which he studied at North Carolina State University in Raleigh. He worked part-time in the store to pay for college, selling his first piano in 1959. He earned $40 a week plus a 3% commission on anything he sold. Upon graduation in 1961, now earning $10,000 a year at the music store, Bill was approached by a recruiter for IBM, who offered him a starting salary of $5,400/year. From that moment, Bill became a lifer in the piano business. He opened his first store, and eventually had a chain of full line stores in North Carolina under Bill Boyce Music. In 1962, he began selling both pianos and organs, renaming his business, Piano and Organ Distributors. In 1982, Piano Distributors became an authorized dealer for Yamaha, the world’s largest manufacturer of musical instruments. To this day, the company continues to be the exclusive authorized Yamaha Piano Dealer in each of its multi-state markets. In 1993, Bill married his beloved wife, Sandra “Sandy” McCowen on the beach in St. Thomas, US Virgin Islands and, semi-retired at the age of 52 now living in Durham, turned over the management of his North Carolina stores to his son, Cliff. Bill and Sandy eventually moved to Florida in 1997 to relax and enjoy their new home on Sanibel Island. However, the idea of retirement was short lived, as Bill quickly found that he had too much love and enthusiasm for the piano business to leave it all behind. He opened his first Piano Distributors store in Sarasota on April 1, 2001, and today, there are nine locations in Florida and Georgia, including a new store in Jupiter, Florida, which opened December 2018. Each location offers all Yamaha piano models including the Clavinova and the Disklavier reproducing piano, along with pre-owned fine brand pianos. Yamaha has recognized Piano Distributors with a Top Dealer Award consistently since 2004. The company maintains an extensive outside promotion schedule, for which Yamaha recognized Piano Distributors as the 2018 “Promotions and Outside Events Dealer of the Year” in January 2019. In addition to running Piano Distributors, Bill served as President of the National Association of Young Music Merchants (NAYMM), which prepares young professionals, ages 21-35, for greater leadership roles within the products industry through business, social networking and leadership development programs, such as industry mentoring. He also enjoyed many years with the KIG group. With Bill’s passing, Piano Distributors is now led by Sandy Boyce and Frank Harvey, who was promoted to President of the company in 2016. Bill is survived by his wife, Sandy; his son, Cliff Boyce; four daughters, Janet Sloan, Kimberly Sieli, Gay Leigh Boyce and Tracy Kolker, and 11 grandchildren. A memorial service for Bill Boyce will be held in Florida at a later date. In lieu of flowers, please consider a donation to the American Diabetes Association in Bill’s name. The Boyce family would like to thank the entire music products industry for its support, love and strong belief in Bill, whose passion for and devotion to his work was legendary. They would also like to thank the staff of the Manasota Davita Dialysis Center for its kindness, help and support in providing Bill’s outpatient care, as well as extend its deepest appreciation to all their friends for their outpouring of love and support.